BAUMA is one of the largest exhibitions in the world, representing one of the key event for the construction and mining industry. With more than 600,000 m2 exhibition space, 3,400+ exhibitors from 58 countries and 580,000+ visitors from 219 countries (2016 edition) BAUMA is a milestone for all the players in the construction and mining market. 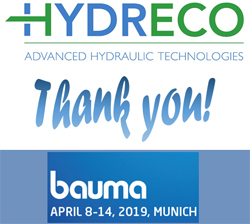 Hydreco will present the entire range of solutions of its portfolio, both in the off-road and on-road market. Under the spotlights: the remote control range and the electronic devices, the gear pumps, the directional control valves, the PTO’s, the dump pumps and the auxiliary devices complete the portfolio of solutions we can provide for the construction and mining industry. Thank you if you met us there!